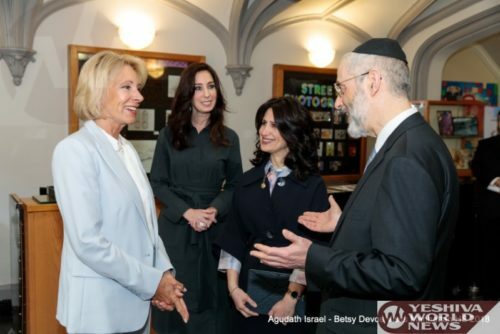 Secretary of Education Betsy DeVos visited an Orthodox Jewish school. 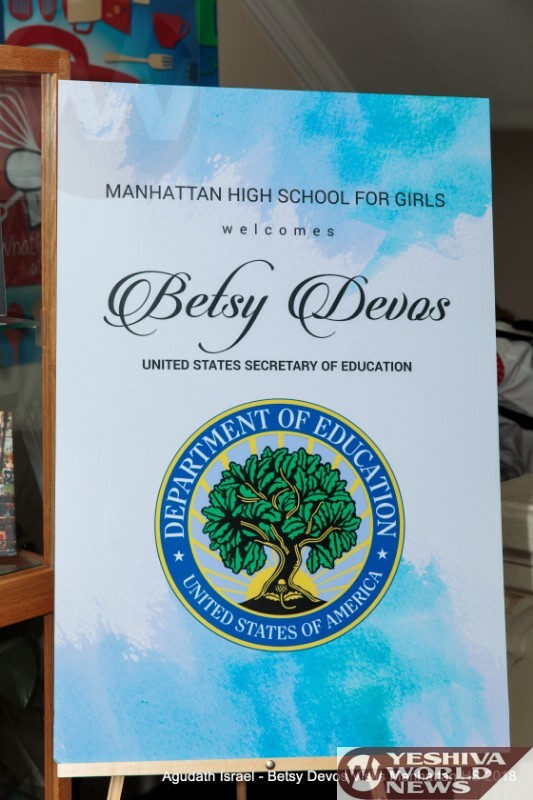 Fulfilling a promise made at an Agudath Israel of America’s leadership mission to Washington in March, 2017, DeVos made the historic visit on Tuesday morning to Manhattan High School for Girls, spending more than three hours sitting in on classes and meeting with students, faculty and board members. 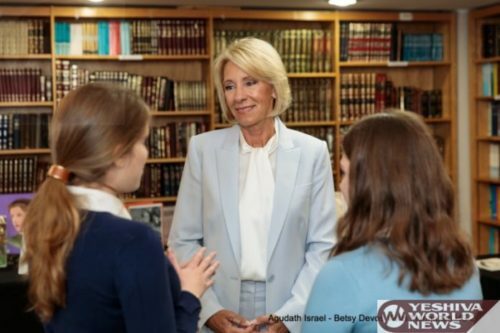 The visit to the school was facilitated by Agudath Israel of America and, in addition to being Secretary DeVos’ first official trip to a Jewish school, is believed to be the first such visit by any sitting Secretary of Education. After being welcomed warmly by Agudah executive vice president Rabbi Chaim Dovid Zwiebel and school principals Mrs. Tsivia Yanofsky and Mrs. Estee Friedman-Stefansky, Secretary DeVos sat in on classes in Scriptures, forensic science, English literature and music. The secretary listened during a class on Jewish history and genealogy as students shared their families’ stories of escaping Nazi persecution in Poland during World War II, telling the teens how her family members in the Netherlands helped Jews escape to safety during the Holocaust. Board members and teachers discussed their commitment to educational excellence that prioritizes strong religious studies while also offering a top tier secular curriculum during a roundtable meeting with Secretary DeVos, observing that the school prepares students for success in later life without compromising on their Jewish values in any way. Describing the school as “a holistic learning environment,” the secretary expressed her admiration for the high standards in evidence that imbued the girls with a clear level of confidence. An informal lunch meeting with students had girls sharing their high school experiences freely with Secretary DeVos, discussing extra-curricular activities, today’s technological challenges and political matters. Several students spoke enthusiastically of their willingness to travel several hours daily to enjoy the school’s stellar academics and Secretary DeVos appeared touched by one girl who told of the school’s support during her battle against leukemia, noting that she hoped to become a pediatric oncology nurse so that she could repay the many kindnesses shown to her during her own illness. At the conclusion of the visit, a pair of twelfth graders presented Secretary DeVos with several gifts, which included a framed illuminated teacher’s prayer, written in both Hebrew and English. Both Mrs. Yanofsky and Mrs. Friedman-Stefansky emphasized that Manhattan High School was honored to introduce Secretary DeVos to the world of Jewish education, giving her a firsthand look at students who are both well educated and deeply committed to their religious roots. 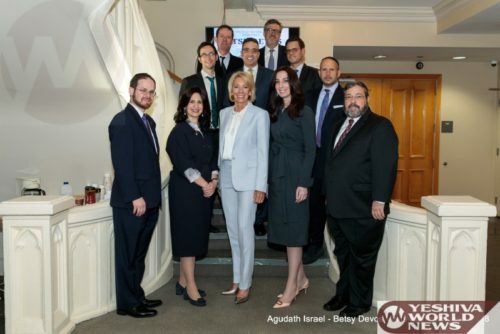 Secretary DeVos’s visit to Manhattan High School and a second visit to Yeshiva Darchei Torah in Far Rockaway are both the result of continued advocacy by the Agudah on behalf of yeshiva parents. With the number of students enrolled in Jewish schools nationwide increasing annually while other nonpublic school constituencies have seen their numbers dwindle, Secretary DeVos’s visit was long overdue, said Rabbi Zwiebel.